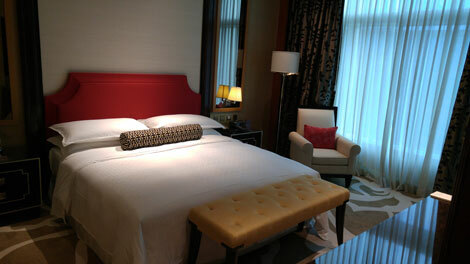 Sheraton Macau is set to become the Sheraton Grand Macau. 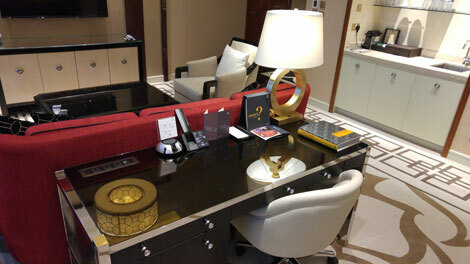 In anticipation of the rebrand, the hotel has unveiled 79 brand new Executive Deluxe Suites and one Terrace Suite. 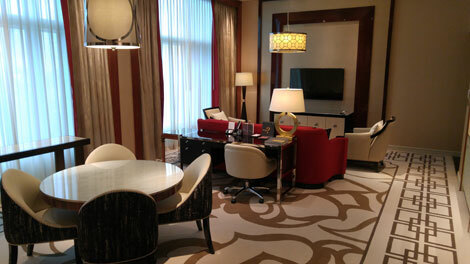 Business Traveller Asia-Pacific was invited to experience the newly renovated Executive Deluxe Suite. The Shertaon Macau has two towers, housing a whopping 4,001 rooms. The Executive Deluxe Suites are located on Levels 40 and 41 in the Sky Tower, and Level 38 to 40 in the Earth Tower – previously closed to the public. Room 4019 in the Sky Tower, where I stayed, was 1,500 sq. 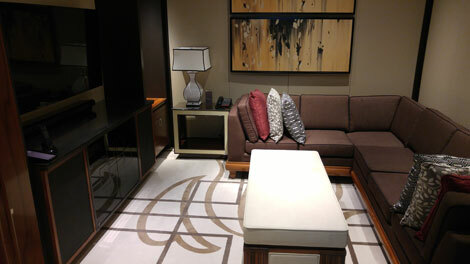 ft (139 sqm) in size and overlooked the Cotai Strip. On entering the living room, I was impressed by the height of the ceiling and the large floor-to-ceiling windows. Plenty of natural light streamed in, making the room feel bright and airy. The living room has a large, comfortable sofa and two armchairs placed around a large flatscreen TV. There is a work desk behind the sofa. While it’s not huge, there is adequate space for placing a laptop alongside working documents. There are also three international sockets and two USB ports at the corner of the desk. I quite liked the placement of the desk, as guests will be facing the TV while working, meaning you can keep an eye on important news stories while you work. Some complimentary stationary would have been a nice touch, but there was just a thin notepad and pen. There is a small open-pantry in the living room, featuring a basin, minibar and coffee machine. A dining area is also located towards the back of the living room, with a round table for four persons. The media room is on the left before you enter the bedroom. This is a great room to relax in, with an elongated L-shaped sofa, comfy cushions and a TV complete with touchscreen remote control. However, this room can also be turned into a karaoke den, thanks to the soundproof materials on the wall. Meeting setup is also possible. A white bench in the middle of the room offers a neat storage space if you pull open the top. The bedroom features a comfortable king-size bed, with both side tables offering USB ports for phone charging. There is also a light gold-coloured bench at the end of the bed, a TV, and a dressing table in the corner. The bathroom felt particularly spacious, with a standalone bathtub, separated toilet and shower room, and two big wardrobes. 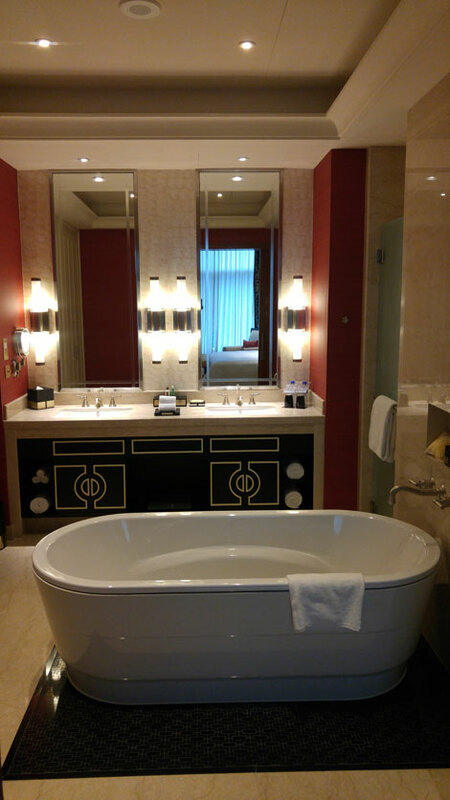 Shine for Sheraton bath products are available. Guests wanting to experience the new suites for themselves should take advantage of the Suite Staycation package – available until December 31, 2015. Starting from HK$3,488 (US$450), the package includes one night in a new Executive Deluxe Suite; exclusive Club Lounge access for two; ferry and limousine transfer and complimentary wifi. Guests can also stay in the new Terrace Suite from HK$8,888 (US$1,147) until December 31, 2015.